If any of you read the Farmer's Almanac, you will notice that a very cold, frigid winter is being predicted for the Great Lakes region and the Midwest. (That means us, Helene! :)) It also states that the East and West coasts will be more seasonable, but winter storms are still likely to happen. We are also expected to have a cool and rainy spring season. So, while nice, fall weather is still right around the corner, now is the time to start planning how you will survive the upcoming winter/spring weather! 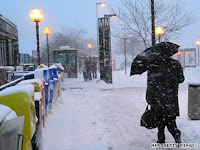 Winter Tip #1: Start now by organizing coats, hats, gloves, mittens, scarves, umbrellas, etc. Winter Tip #2: Check flashlights and install fresh batteries, if needed. If you use kerosene lamps when there is power outages, now is the time to clean it, put in fresh kerosene, check the wick, make sure that you have enough matches or lighters, and stock up on lamp supplies. Winter Tip #3: If you use a kerosene heater for emergency heat, the Tip #2 applies. Make sure that it is fully operational, empty and fill with fresh kerosene, wipe down the outside of the unit, and check the wick. Winter Tip #4: Do you use a generator (either portable or whole house)? Now is the time to do routine maintenance and make sure that everything on the unit is functional. Winter Tip #5: Take advantage of sales and stock up on foods that do not require refrigeration or heat. Examples would be peanut butter, jelly, canned fruits, crackers, granola bars, etc. In case of a power outage, you need to have some staples on hand in order to feed your family. Winter Tip #6: Stock up on bottled water. We have city water, so during power outages, we still have fresh water. But, just in case, I like to have my own supply. If any of you are having cool, sunny weather today, I hope you have a chance to get outside and enjoy it! It is going to be about 75 degrees and sunny here today. I am hoping for a chance to get outside and work in my garden! Thanks, mom. I'll get right on it. I was just looking at my bag of salt in the hall closet over the weekend (another moms minutes mind reader moment from Earlene) and wanted to get stocked and ready for winter. It will be here way too fast.